At the invitation of Russian Foreign Minister Sergei Lavrov, Foreign Minister Wang Yi will pay an official visit to Russia from 25 to 26 May. According to the mechanism of reciprocal visits between Chinese and Russian foreign ministers, Foreign Minister Wang Yi will pay an official visit to Russia. During the visit, Foreign Minister Wang Yi will meet with Russian leaders and hold talks with his counterpart Sergei Lavrov. The two sides will make political preparations for China-Russia high level contacts and fully exchange in-depth views on international and regional issues of common concern. Facing complex and volatile international situation, China and Russia will, while following the important consensus between President Xi Jinping and President Vladimir Putin, keep close communication and coordination, maintain the continuous development of the China-Russia comprehensive strategic partnership of coordination at a high level and inject more positive energy to regional and world peace and stability. Q: On 23 May, the Ethiopian candidate Tedros Adhanom Gebreyesus was elected as the next WHO Director-General. What is your comment? A: China warmly congratulates the former Ethiopian Health Minister and Foreign Minister Tedros Adhanom Gebreyesus on his election. As the first WHO Director-General from Africa and with rich experience and qualifications, Mr. Tedros makes the right person to be the next WHO Director-General. We believe that during Mr. Tedros' tenure of office, he will play an important role in improving global health. China will support and cooperate with the Director-General in his work. Q: Chinese student Yang Shuping gave a controversial commencement speech at Maryland University on Sunday which created some anger in China. Does the Chinese government believe that Chinese students, when they are abroad, especially when in the US, have an obligation to make responsible comments about China? Was the Chinese Embassy in Washington involved in this controversy? Is the Chinese government issuing any new guidance for Chinese students going overseas on what they should or should not say? A: On your first question, I would like to say that any Chinese citizen should be responsible for the remarks he or she makes. This applies to not only China-related issues, but also other issues. As to the involvement of the Chinese Embassy in the US and the issuance of guidance for overseas Chinese students, I have not heard about that. In fact, what you asked is not a diplomatic issue, but I would like to make a few comments since you have raised this question and given that there are also many remarks on the Internet. I think many netizens believe that every country has what it takes pride in, while it may also encounter some problems in its course of development. When a citizen makes remarks on his or her own country, regardless of the occasion and the way, others can easily sense the feelings he or she shows towards the motherland. I also notice that the above-mentioned student has made a statement or, so to speak, an apology later on. She said that she loved her motherland and wished to come back to make contribution to it after graduation. If this is true, I should say that, many young Chinese students are now studying overseas, whose views and perceptions of some things may change and evolve after going abroad. But as long as they love their country deep down their heart and stands ready to contribute to it, I believe the Chinese government will encourage, support and welcome them. Q: The second meeting of the 21st Century Panglong Conference in Myanmar is to be held in Myanmar's capital Nay Pyi Taw. What efforts has China made for the convening of this meeting? Which official will China send to the event? What is China's expectation for that? A: As a friendly neighbor, China supports any effort that will promote Myanmar's peace and national reconciliation. The 21st Century Panglong Conference is of important significance to enhancing the mutual understanding and trust between relevant parties, advancing the peace process and promoting national reconciliation in Myanmar. 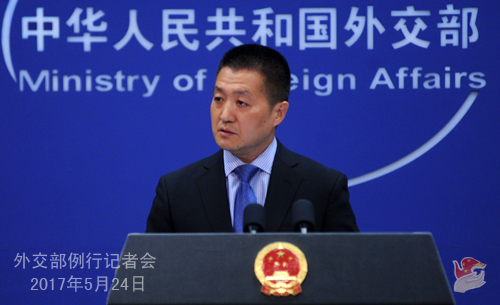 China extends congratulations on the convening of the meeting. We hope the relevant parties will stay committed to solving differences through dialogue and negotiation, secure a nationwide ceasefire at an early date and create conditions for enduring peace. At the invitation of Myanmar, Sun Guoxiang, Special Envoy of Asian Affairs of the Ministry of Foreign Affairs of China, will lead a delegation to the meeting. The Chinese side will continue to play its role in promoting peace talks as wished by the Myanmar government and other relevant parties. Q: There are reports saying that when President Xi Jinping met with President Trump in April, he asked for a 100-day grace period to deal with the DPRK's military provocations. Can you confirm whether it is true and share details on what this 100-day plan entails? A: This is not true. During their meeting at the Mar-a-Lago resort, President Xi Jinping and President Trump got to know and learned about each other and established good working relations. We have introduced the talks between the two heads of state. The two sides have extensive and in-depth discussions on how to promote China-US relations and advance practical and productive cooperation in a wider range of areas, and also fully discussed the situation on the Korean Peninsula. I will refer you to the relevant information we released earlier. Q: The southern city of Marawi in the Philippines was reportedly hit by an terrorist attack, with a fierce bout of fighting between the Maute group and the government forces. Defence Secretary Delfin Lorenzana said 3 soldiers were killed and 12 people injured. What is your comment? A: Terrorism is the common enemy of mankind. 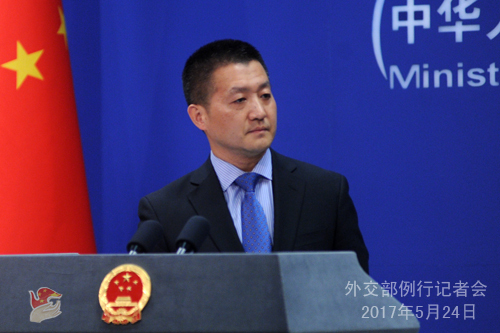 China understands and firmly supports the Philippine government in cracking down on terrorism. We believe under the leadership of Present Duterte, the Philippine government will surely safeguard security and stability in the Mindanao region. Q: It is reported that an Indian Air Force Sukhoi-30 jet and the two pilots on board went missing somewhere close to China-India border yesterday. So far the search has proved futile. Is there any information that China has in this regard? Will China come forward in search of this plane with two pilots? A: First and foremost, Chinese government's stance on the eastern section of China-India border has been consistent and clear. We closely follow the situation in the southern part of Tibet and hope India can abide by the relevant agreements and accords between the two countries and avoid any incidents that may undermine peace and stability of the border areas. On your second question, I have no information at hand.